In the provocative third episode of “The Writers’ Room,” airing Monday, August 12th at 10pm ET/PT on Sundance Channel, host Jim Rash and Entertainment Weekly editor Dan Snierson sit down with the writing team behind “Dexter,” the Emmy® Award-winning show about everyone’s favorite serial killer, starring Emmy®-nominated actor Michael C. Hall. The group shares their thoughts on the real tragedy behind Dexter’s character and reveals some of the “bad” ideas that were left dead on the writers’ room floor. Hall also shares his perspective on the similarities between his character David Fisher (“Six Feet Under”) to his character in “Dexter:” “I kind of feel like David Fisher was Dexter Morgan’s first victim,” says Hall. In an engrossing half-hour, Hall, Sara Colleton (Executive Producer for “Dexter”) and the writing team, delve into what it's like to tap into your dark side. Watch after the jump, an exclusive sneak peek from tonight's episode! 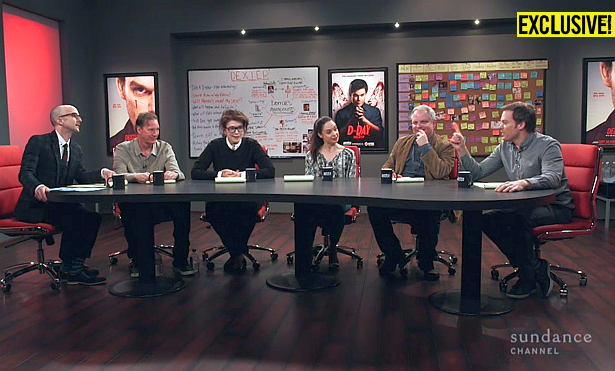 “The Writers’ Room” is in conjunction with Entertainment Weekly and airs tonight at 10:00 PM on Sundance Channel. Don't miss it!